earlier by his campaign manager. 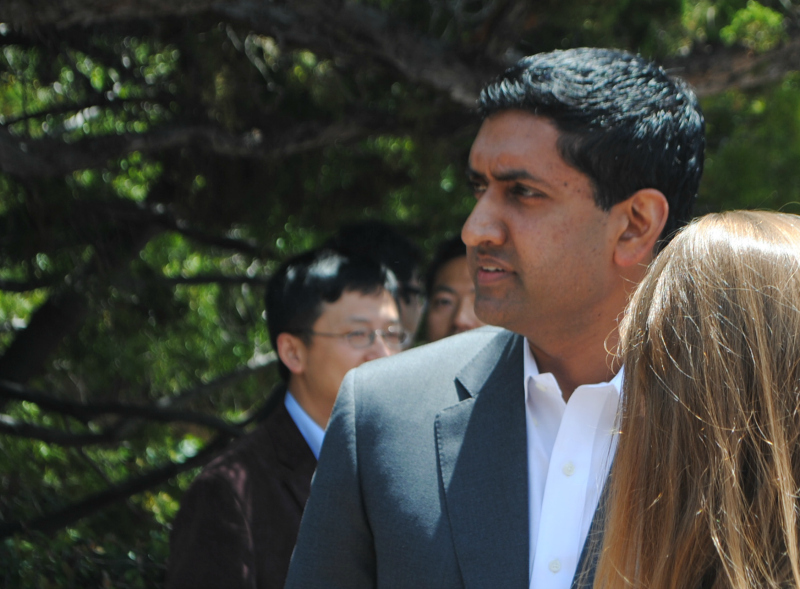 The founder of the progressive online community Daily Kos says Ro Khanna’s campaign manager created up to two phony screen names on the Web site to surreptitiously attack a damning story posted on Sunday. The site is strict about users disclosing their relevant paid political associations, Markos Moulitsas wrote Tuesday. In certain cases, such as these, he added, the site publicly shamed Khanna’s campaign manager Brian Parvizshahi in a posting. The original article described how Khanna’s recently-named campaign co-chair Niloufar “Lily” Sarafan had exceeded the legal maximum donation by using both her first name and nickname, Lily, to contribute a total of $5,400–twice the legal limit per election cycle–to the campaign. Glen the Plumber argued that Sarafan, a South Bay insider, had held fundraisers for the campaign in the past and should have known about the contribution limits. In addition, the timing of the additional donations appeared to correspond with the end of the reporting deadline this summer. “Oh the horror that Lily, who is a highly respected member and fundraiser for the Democratic party, use the same address,same job title, and same last name, but a different first name,” bayareadubs responded in the comments section. A screenshot was included in the comments showing potentially the same example on Honda’s campaign finance report..
Khanna said Tuesday the discrepancy in Sarafan’s contribution was a clerical error. The Sarafans used a joint checking account to make the donations causing the mistake, and the entire $5,400 was refunded, said Khanna. The second $2,700 contribution was intended to be from Sarafan’s husband, he added. Khanna’s legion of online defenders has in the past been strong and prevalent. During the 2014 race between the same two candidates, Khanna’s campaign featured a small team of highly-paid staffers who, using their own names, routinely trolled dissent toward Khanna on Twitter and aggressively shaped the conversation in favor of the candidate on the same site and other social media platforms. Posted in 2016 Election, Brian Parvizshahi, CA17, campaign finance reports, campaign manager, congress, contributions, Daily Kos, donations, Glen the Plumber, Markos Moulitsas, Mike Honda, Niloufar Sarafan, Ro Khanna. Bookmark the permalink. Ah, silly season where folks make a deal out of nothing…riddle me this: how many votes does it cost Khanna that his campaign manager was caught doing this rather than knocking on doors or making calls? Or that DailyKos (which no persuadable voters read) was hypocritical (because they didn't allow sock puppet accounts from campaigns when those campaigns are consistent with Kos's pre-existing political bias) Seriously, other than showing how inefficiently this random CM is allocating his time, what does this even matter? I do think it speaks volumes that this campaign has time for this nonsense while it seems like the other side rarely Tweets. I was a victim of Khanna's troll army in 2014. After I criticized his ties to Ron Conway. Khanna's campaign manager contacted my employer, a small non profit, that could be subjected to funding issues if powerful interest of the kind that back Ro wish it so. One Democrat (Khanna) fighting with another Democrat (Honda) and their petty, self-involved staff can't even be honorable enough to comment and “troll” under their own names! God forbid these folks ever get any real political power. Although, with Hillary, they will fit right in! Ro won the primary! There is no reason the engage in childish internet ploys. This is exactly what people hate about politics. Kaplan stands in solidarity with Kaepernick, but will she sit for the cause?